This Parador is in a imposing castle, whose construction commencing in 1437. It was the former residence of the Dukes of Feria, one of Spain’s great families. The spectacular façade of this castle / palace shows its importance in the fighting period in which it was built. There are large chests, ironwork, handrails and several other decorative details which belonged to the former palace. The elegant and spacious bedrooms which in the past had Hernan Cortes, a controversial Spanish conquistador in the early 16th century, as a guest. Outside the seasonal swimming pool sits is in the well cared for garden. Caldereta de cordero - lamb stew. In Zafra visit the Santa Clara Convent, the Big and the Small Squares and Palace of the Marqués de Solanda. There is a cattle fair is in the first week of October while in Jerez de los Caballeros, the Ham Fair is in the first week of May. Luna al Fuego, a 17th century festival, takes place during the last week of June. In the countryside surrounding the hotel are many sporting opportunities, You can go swimming, walking, horse riding or mountain biking. If a tour by car is more appropriate, the route of the Duchy of Feria will takes you to villages like Feria, Salvatierra and Almendralejo while the route of the Templars will takes you to Burguillo del Cerro, Jerez de los Caballeros and Frenegal de la Sierra. The Parador of Zafra has thirty seven twin bedded rooms, nine rooms with a double bed, one single room, two suites and two easy access rooms. All the rooms have a private bathroom and also a telephone, television with TV canal plus, safe and a mini bar. The Zafra Parador has air conditioning, central heating, currency exchange, lift, satellite television, free wireless internet, garden and a seasonal swimming pool . There is a restaurant (Gastrobar) and bar. Facilities are available to hold business meetings. Distance from the nearest airport is approximately 54 kms and the nearest train station is 1 km away. The traditional restaurant is now closed. Meals are served at the 'Gastrobar' with an informal but complete offer. Breakfast and event services will still be served at the Parador. 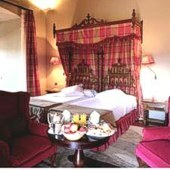 Comment posted by M & M C.
We had a wonderful time staying in the paradors in Extremadura on your ‘ruta de plata’. 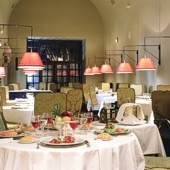 My wife and I were part of three couples who overnighted at Parador Zafra and we all loved our stay. The facility is magnificent and the setting near the center of the town was perfect. Our room was very nice with a superb view across the park in front of the castle, overlooking the rooftops of the center of town. We throughly enjoyed relaxing in the bar and the breakfast spread was impressive. The staff was extremely nice and helpful. I highly reccomend it for a fun and relaxing stay. 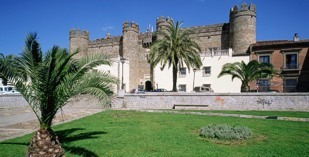 Parador de Zafra is in a modernised castle built in 1437.